The Subiaco Oval takes its name not from some multi-national corporate sponsor, but from the name of the Perth suburb in which it is located in Western Australia. Sport was first played there in 1908 and the ground is now primarily used as the home field for Australian rules football teams the West Coast Eagles and Freemantle Football Club. 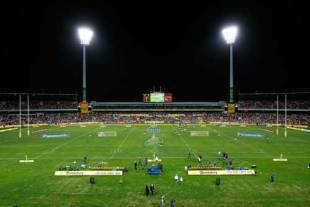 It also once served as the home base for the Western Force Super Rugby franchise. Test match rugby is also played there, with the Wallabies fulfilling Tri-Nations fixtures, as well as entertaining touring nations. The ground will forever bring back happy memories for England rugby fans as it is here that Sir Clive Woodward's men played their opening two group games in the World Cup of 2003. England opened up their victorious campaign with an 84-6 trouncing of Georgia, before going on to beat the Springboks 25-6. Because this is first and foremost an Aussie Rules ground, the playing area is an oval, which means the crowd is set back a considerable way from the sidelines when the ground is configured for rugby union. After much political wrangling and public debate, the 43,500 stadium has been scheduled for demolition in 2014, to make way for Stadium WA. This new construction will be a high-tech 60,000-seater venue, on an adjacent site at Kitchener Park, with retractable seating to cater for both oval and rectangle field sports. The stadium lies three kilometres to the west of Perth city centre and is served by trains to Subiaco and West Leederville stations, and on match days extra bus services are laid on. Because of Subiaco's outlying location, post-match festivities for the supporters are normally joined back in the city, predominantly in the Northbridge area of town.